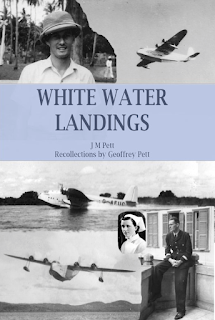 From midnight 18th June to 24th June White Water Landings for Kindle will be on special promotion on Amazon.co.uk and Amazon.com. Just in time for Father's Day you can pick up the ebook for 99p (inc. VAT) - but after midday on the Sunday the price rises to £1.99. This is still a terrific discount on the normal price of £3.33. On Amazon.com the promotion runs slightly differently - starting at 99c, it goes through $1.99, $2.99 and finally $3.99 before going back to its usual price of $4.98. The promotion continues through to the end of June 24th, which is the day Geoffrey's family will be celebrating what would have been his 100th birthday. So, it's either a Father's Day Extravaganza with a birthday twist, or it's Midsummer Madness, covering both the longest day and Midsummer day! These prices apply only to White Water Landings on Amazon.co.uk and Amazon.com. Click the picture to go to Amazon's UK White Water Landings page.